Brian Reitzell is one of the best-kept secrets in Hollywood, but 2014 might be a turning point for this composer with numerous albums released this year, representing years of work. One of his many recent releases is music for the video game Watch Dogs, which has been in development since 2011. Representing an electronica bent in Reitzell's aesthetic, the score is a dramatic piece of work that exhibits how the tides have shifted in video game creation. I spoke with Brian recently about this creative endeavor and how its composition was interwoven with everything else on his incredibly full plate. When and how did you get attached to the project? I was contacted by one of the Ubisoft Music Supervisors in August 2011. I met with them at their offices in Montreal in October. They were interested in bringing me in on account of my film music. They wanted to score it as much as possible like a film, make it cinematic. They knew I had done one other video game so they were confident that I could handle the deliveries for a game which are so different from that of a Hollywood film score. I met with the writers, developers, animators, music and sound departments while up in Montreal. Just a massive group of creative specialists all working and programming together in this expansive ultra-high-security, just totally awesome warehouse complex unlike anything I had really seen on a film set. I filled my head with information up there and then started scoring in November 2011. Trailer for Watch Dogs, below, contains adult content. What is the game about? Can you explain it from your perspective? The game takes place in Chicago in the very near future. The main character is this guy Aiden. Aiden is a super-hacker fugitive vigilante. The city of Chicago is run on a computer operating system that Aiden is able to hack into, thus giving him the power to control and gain access to anything in the entire city — alarms, stop lights, other peoples phones, bridges, cars, etc. It's an open world game, which means you can literally just trawl the streets of Chicago and explore or get involved in a mission to save one of the characters involved in the game's plot or even be a criminal and steal cars and such, it's up to you. Did the sound evolve significantly over the course of the work or did you hit the right ideas early on? Honestly, when you work on something this long it has to evolve. The original idea was a bit more old-school electronics: analog sequencers and modular, mono synths, like Tangerine Dream in their Phaedra era. It shifted a bit as things moved along over the years into being more organic: cello, guitars, real percussion. The original style and sound palette remained, it just grew a bit into a larger orchestra of sounds. The original idea worked right away, but it grew over time. Was your score for the game Red Faction a guide at all for what you wanted to do, or what the game designers wanted you to do? No, though I know they had used a few Red Faction cues from the soundtrack for their early renders to see how my vibe would work with the visuals. We always discussed it being it's own thing and not a re-creation of any of the Red Faction sounds or concepts. I learned from Red Faction how to do a video game, so with Watch Dogs I knew it could be approached and delivered in a more musically interesting way. Red Faction was totally modular and the cues were more about being shorter loops that can be rearranged and layered by the effects of the game console to suit the on screen happenings. With Watch Dogs I still had to deliver music that could be looped and layered but I found ways to manipulate time to allow me to deliver much longer musical passages. In a nutshell, I made more musical cues and implemented free tempos, which fit the concept of an open-world game better. It gave it more space by not having so much repetition and precision of time. Were you drawing from any other specific influences for this? At the time, the movie Drive had come out and everybody in the business wanted what they were calling the "Tangerine Dream" synth score. I don't think of the Drive score as sounding like Tangerine Dream, so I thought I would do something that was actually like those early to mid-period TD recordings: Rubycon and Phaedra, with a hint of Zeit thrown in. It took several years to make Watch Dogs. I did film and TV show projects in between. I was working on the Bling Ring score for part of it, so I'm sure Klaus Shulze was an inspiration as well. In looking at this and Red Faction it seems video games bring a certain sound to your palette: there's particularly more use of synths and the creation of a very electronica sound. Would you say this is accurate? Yes, indeed. Much of the cues I have to do for a video game are action cues, so there's tons of drums in Red Faction and aggressive sounds, rhythms, pulses, etc. Watch Dogs was always meant to be electronic. I wanted it to be 100% old-school electronic but not "retro" — I hate that term. I had been doing so much organic acoustic music that I wanted to go the other way a bit. This was the reason I decided to do Watch Dogs in the first place. I need to change things up a bit for myself to keep things interesting. I always try to keep moving and experimenting and learning new techniques — some of which are actually old techniques, as with the analog sequencers. Drums and synthesizers are well-suited to video games. I have been collecting electronic instruments for as long as I can remember, so it's nice to get to play with them from time to time. I'm curious how you were able to maintain the rich organic sound of bells, piano, and bass — as on the track "IP Tracking" — in a way that really built its own sound when blended with the more electronica. The whole record really does this incredibly well. It's the blend of real instruments with the analog synths and guitar as well as analog effects like the phase shifter on that track you mention. Real piano, guitar, woodwinds, strings, percussion, etc., blended with something like a Roland 909 drum machine, a mono sequencer, and synth bass. "IP Tracking" has a Rhodes bass which you plug in like you would a guitar into an amp. It's all real stuff. It's all played live; that's why it does sound organic. I also might "treat" my acoustic instruments to help bring them more into the synthesized world. Percussion instruments like bells and chimes can often sound like the world's finest synths when you edit them and make pads out of them. Layering those techniques on top of say a PPG wave synth gives you a lovely balance and just tons of dimension. There's a lot of percussion instrument blends in my work. The electric guitar takes great prominence in this work. Why did that work really well for you with this specific project? The use of guitar is because of Chicago. I had been working on the TV show Boss, which also took place in Chicago. It's a bit of a cliche musically that Chicago is known for the blues, but it works and can be done without being so obvious. By surrounding the guitar with other things and or playing it differently or altering its sound you can make some interesting music. Did you find bleed-over from work with Hannibal or other film work like The Bling Ring — especially since this score took a long time and overlapped with so much of your other work? "Revelation Number 3," "IP Tracking," and "Vigilante" specifically have percussive ideas that carry a similar presence to the way you use percussion in Hannibal, but then you've layered it with other atmospherics, guitar, and bass. Yes, everything flows through each other a bit. I like that. It's really more about where I am at the moment feeding into what the different project needs. There are connections, as I mentioned, with both The Bling Ring and Boss. I think over the course of working on Watch Dogs I did four films, three TV shows, an art installation, a short film, four commercials, and another video game plus a few record projects, so I was always going from one into another. I managed to work on Watch Dogs for a month here and there when I wasn't working on one of the other projects, so it all flowed fairly smoothly. Knowing how you tend to score film and television — especially with television having such a quick turnaround — how different is video game composing for you? Does the length of the project change your approach? Video game scoring is very different from TV and film. It's the hardest! It's akin to running a kitchen, which I did as a young chef years ago up in the Bay Area. You are making music to order. You deliver very specific cues with all the garnishes — modulation, tempo, key, etc. You deliver by the minute, down to the second for each cue: one minute of this, 30 seconds of that, two minutes here and seven minutes of scoring to picture here. Game play in this specific neighborhood for four minutes divided into eight sections, etc. It's a very precise process. I really quite enjoy it, as I did working in kitchens. Making the menu, ordering the produce, fish, meat, developing the dish, prepping the ingredients, and then being a line cook making the orders. I try to approach it all the same as I would a film score but I have to deliver things in far more scientific manner — which makes it much harder in some respects than, say, a TV or film score. Do you consult the sound designers for the game much or concern yourself with the final mix to know the prominence of your work or how it will be used? A bit. I spoke to the sound effects people when I went up to Montreal. Video games use sound effects differently then, say, Hannibal, where I do most all of the sound design. With video games I just let [the sound designers] do their thing and don't get involved in the mix. Once it leaves my studio it's totally out of my hands. With tracks like "Donovan," where the entire piece is really layers of percussion and instruments played more percussively, how do you find the balance among all the rhythms so that it works so eloquently as a whole without becoming noise? That track was approached like a Giorgio Moroder track, with sequencers and percussion layers. It was built like a dance track where you could play around by dropping things out or adding things in. Many of the tracks are built to be massive polyrhythmic structures that can go on for days without repetition by playing different combinations of the multi track. I do come at it with a percussion background, so writing rhythmic parts comes very natural to me. Everything works together and yet it all has to work on its own as well. I love making those kinds of puzzles: layering and layering until I have used all 256 tracks of ProTools for a single cue. Some tracks will only have one little sound on them that happens once or twice, but when everything is in you have this wonderfully complex living tapestry of music. Again, it's like cooking. Some dishes require tons of ingredients and days to cook with so many steps to get them all combined in the right harmonious way. How much music did you end up composing for the game entire? I think I delivered technically 100 minutes, plus a few cues for marketing spots at E3 and such. I also did separate mixes for the soundtrack and a bunch of alternate mixes as well. I found ways to over-deliver so that the cues could play much longer. You get paid by the minute, so I didn't get paid for everything, but that was my prerogative. In the end we must have delivered three or four hours of music over the course of three years. How did Invada come to release the record on vinyl? Ubisoft sent the record to them and they liked it enough to want to put it out. I think they have a relationship. Invada put out the soundtrack to Far Cry 3 and a bunch of really cool LP scores like Solaris, Drive, and Under the Skin, plus Geoff plays with Portishead and I played with Air for years, so it feels like such a natural fit. I'm really pleased they are releasing it and doing such a great job with the packaging and pressing. 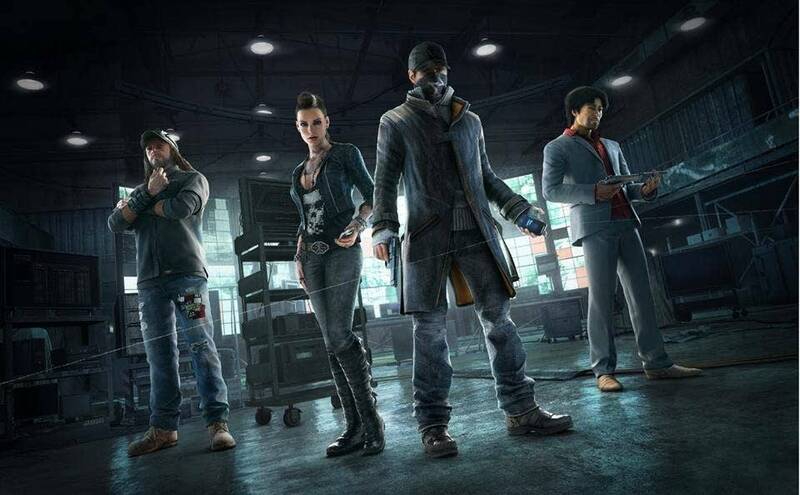 What would you say you enjoyed most about working on Watch Dogs? I love working in the whole video game medium. It's very much like cooking and the discipline that goes with that, which I have always liked. I like the heat in the kitchen! I like being able to apply music in creative ways to new technologies and new environments. I'm really into video game synthesis and finding new ways to explore and implement sound into multi media forms. I also love manipulating time and thinking about new methods to pass along to the developers so we can all continue to grow and broaden the whole experience of incorporating sound into video games. There is so much cool stuff we can do now and way more interesting things on the horizon as the technologies catch up and things like bandwidth and the mobile platforms and such get better and better. If I only did video games I would lose my mind, but by doing one every few years in between my other projects it helps keep me invigorated and thinking about new directions for sound.